This awesome, easy-living, home away from home is right by the river and near the surf. This Beach House is cool, light and breezy featuring bifold doors that open right out onto the verandah totally ready for you to spend your days in the sun or quiet winter days inside. Boasting 2 bedrooms, 1 with Queen bed and the other a double and single bunk above. 1 Bathroom\Laundry that is efficient and compact with an amazing size shower you can that you can put all kids in together or comfortably hold your infant in. The luxury of having "The Garage Coffee" cafe located only a 30 second walk from the unit, or "The Groove Cafe" only a 2 minute walk (opposite direction) ensures the pleasurable coffee hit on a lazy morning. The perfect writers retreat to escape the distractions that prevent completion! The fully equipped kitchen holds all you need to cook an entire meal or an outside bbq to continue enjoying the weather. The lounge is beautifully appointed, including a wall mounted, romantic fireplace and a large screen TV for cool or lazy days inside. Parking is suitable for 2 cars. Bedrooms, linen and towels provided according to number of people staying - extra people or extra bedroom incurs an extra fee. 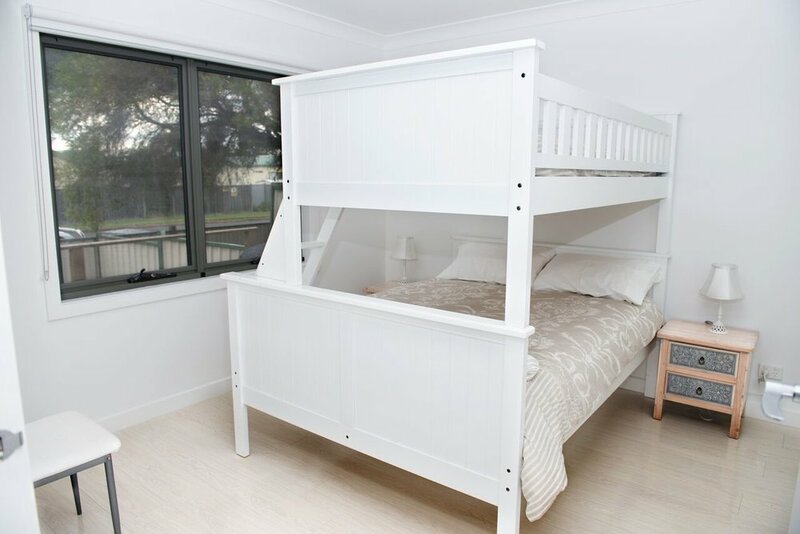 In walking distance to all the best parts of Ocean Grove including restaurants, river, surf, walking tracks, golf course and short drives to other amazing places like Adventure Park, Jirrahlinga Koala and Wildlife Sanctuary, local wineries or even private chartered flights in Barwon Heads. A bus travels to Ocean Grove from Geelong, however, a car is handy. Not suitable for schoolies and not suitable for any pets. This unit is declared allergy free (pet dander) and NO pets can be allowed. Please note that a booking for two is assumed to be one bedroom. Please advise if two business travellers are booked using 2 bedrooms, as that is double linen.